characteristic at all. What then ARE they dated by? DATED BY FOSSILS?—The strata are said to be dated by FOSSILS! Well. now we have arrived at something concrete. The strata are all mixed up. piled on top. under where they should go. or totally missing. But at least we can date by all the fossils in them. But wait a minute! We cannot even use 99 percent of the fossils to date them by. since we can find the same type of fossils in one stratum as in many others! And in each stratum are millions of fossils, representing hundreds and even thousands of different species of plant and/or animal life. The result is a bewildering maze of mixed-up or missing strata. each with fossil prints from a wide variety of ancient plants and animals that we can find in still other rock strata. Yet, amid all this confusion, evolutionists tell us that fossil dating is of extreme importance. That is very true, for without it the evolutionary scientist would have no way to try to theorize "earlier ages" on the earth. Fossil dating is crucial to their entire theoretical house of cards. But if rocks cannot be dated by most of the fossils they contain.—how are the rocks dated? ROCKS ARE DATED BY INDEX FOSSILS—(*#5/6 Index Fossils*) The strata are dated by what the evolutionists call "index fossils." in each stratum there are a few fossils which are not observed quite as often as the other strata. As a pretext. these are the fossils which are used to "date" that stratum and all the other fossils within it! It may sound ridiculous, but that is the way it is done. What are these magical fossils that have the power to tell men finding them the DATE—so many millions of years ago—when they lived? These special "index" fossils are generally small marine invertebrates— backboneless sea animals that could not climb to higher ground when the Flood came! Their presence in a sedimentary stratum is supposed to provide absolutely certain proof that that stratum is just so many millions of years "younger" or millions of years "older" than other strata! "Most of the species of maidenhair are extinct; indeed they served as index fossils for their strata until one was found alive." "The youngest fossil coelacanth is about sixty million years old. Since one was rediscovered off Madagascar, they are no longer claimed as 'index fossils'—fossils which tell you that all other fossils in that layer are the same ripe old age. "—Michael Pitman, Adam and Evolution (1984), pp. 186, 198. In reality, within each stratum is to be found an utter confusion of thousands of different types of plants and/or animals. The evolutionists maintain that if just one of a certain type of creature (an "index fossil") is found anywhere in that stratum, it must automatically be given a certain name,—and more: a certain date millions of years ago when all the creatures in that stratum are supposed to have lived. Yet, just by examining that particular index fossil, there is no way to tell that it lived just so many millions of years ago! It is all part of a marvelous theory, which is actually nothing more than a grand evolutionary hoax. Experienced scientists denounce it as untrue. Any rock containing fossils of one type of trilobite (Paradoxides) is called a "Cambrian" rock, thus supposedly dating all the creatures in that rock to a time period 600 million years in the past. But rocks containing another type of trilobite (Bathyurus) are arbitrarily classified as "Ordovician," which is claimed to have spanned 45 million years and begun 480 million years ago. —But how can anyone come up with such ancient dates simply by examining two different varieties of trilobite? The truth is that it cannot be done. It is science fiction to even pretend to do so. Add to this the problem of mixed-up index fossils— when "index fossils" from different levels are found together! That is a problem which paleontologists do not publicly discuss. 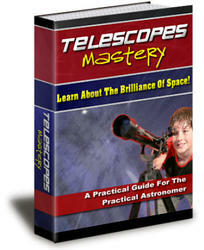 As we analyze one aspect after another of evolution (stellar, geologic, biologic, genetic, etc. ), we find it all to be little more than a carefully contrived science fiction storybook. Darwinists theorize which animals came first—and when they appeared on the scene. And then they date the rocks according to their theory—not according to the wide mixture of fossil creatures in it—but by assigning dates—based on their theory—to certain "index" fossils. —That is a gigantic, circular-reasoning hoax! "Fossils provide the only historical, documentary evidence that life has evolved from simpler to more and more complex forms. "—*Carl O. Dunbar, Historical Geology, 2nd edition (1960), p. 47. The conclusions about which fossils came first are based on the assumptions of evolution. Rock strata are studied, a few index fossils are located (when they can be found at all), and each stratum is then given a name. Since the strata are above, below, and in-between one another, with most of the strata missing in any one location,— just how can the theorists possibly "date" each stratum? They do it by applying evolutionary speculation to what they imagine those dates should be. "Vertebrate paleontologists have relied upon 'stage of evolution' as the criterion for determining the chronologic relationships of faunas. Before establishment of physical dates, evolutionary progression was the best method for dating fossiliferous strata."—*J.F. 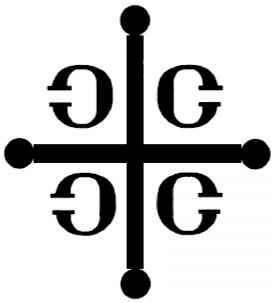 Evernden, *O.E. Savage, *G.H. Curtis, and *G.T. James, "K/A Dates and the Cenozoic Mammalian Chronology of North America," in American Journal of Science, February 1964, p. 166. "Fossiliferous strata" means fossil-bearing strata. 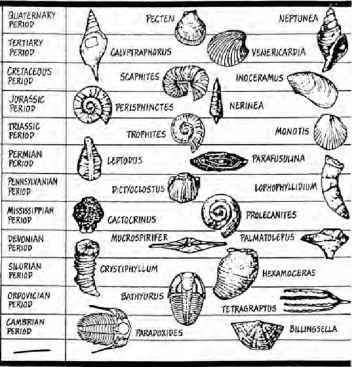 Keep in mind that only the sedimentary rocks have fossils. for they were the sediments laid down at the time of the Flood. which hardened under pressure and dried into rock. You will find no fossils in granite, basalt, etc. "The dating of each stratum—and all the fossils in it—is supposedly based on index fossils, when it is actually based on evolutionary speculations, and nothing more. Randy Wysong, The Creation-Evolution Controversy (1976), p. 31. The "index fossils" are dated by the theory. Amid all the confusion of mixed up and missing strata, there would be no possible way to "date" rocks—or fossils—by the catastrophic conditions found in sedimentary strata. It is all utter confusion. So the evolutionists apply a theory to the strata. "Because of the sterility of its concepts, historical geology, which includes paleontology [the study of fossils] and stratigraphy [the study of rock strata], has become static and unreproductive. Current methods of delimiting intervals of time, which are the fundamental units of historical geology, and of establishing chronology are of dubious validity. Worse than that, the criteria of cor relation—the attempt to equate in time, or synchronize, the geological history of one area with that of another— are logically vulnerable. The findings of historical geology are suspect because the principles upon which they are based are either inadequate, in which case they should be reformulated, or false, in which case they should be discarded. Most of us [geologists] refuse to discard or reformulate, and the result is the present deplorable state of our discipline. "—*Robin S. Allen, "Geological Correlation and Paleoecology, " Bulletin of the Geological Society of America, January 1984, p. 2. Big names and big numbers have been assigned to various strata, thus imparting an air of scientific authority to them. Common people, lacking expertise in the nomenclature of paleontology, when faced with these lists of big words tend to give up. It all looks too awesome to be understood, much less challenged. But the big words and big numbers just cover over an empty theory which lacks substantial evidence to support it. CIRCULAR REASONING—(*#6/10 Circular Reasoning*) When we examine it, we find that the strata-dating theory is based on circular reasoning. "Circular reasoning" is a method of false logic, by which "this is used to prove that, and that is used to prove this." It is also called "reasoning in a circle. " Over a hundred years ago, it was described by the phrase, circulus in probando, which is Latin for "a circle in a proof." There are several types of circular reasoning found in support of evolutionary theory. One of these is the geological dating position that "fossils are dated by the type of stratum they are in while at the same time the stratum is dated by the fossils found in it." An alternative evolutionary statement is that "the fossils and rocks are interpreted by the theory of evolution, and the theory is proven by the interpretation given to the fossils and rocks."